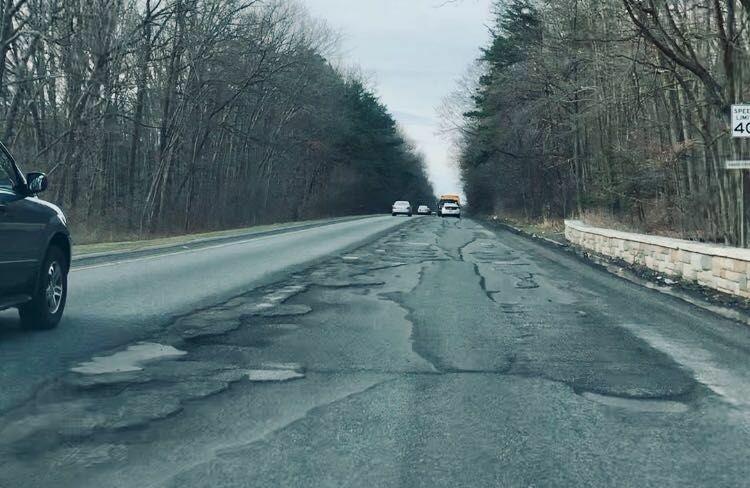 Work to patch a minefield of potholes on the BW Parkway concluded Sunday morning, after northbound and southbound lanes were periodically closed throughout the weekend for emergency roadwork. Crews worked on parts of the northbound portions of the parkway Saturday night, patching some of the most pothole-ridden sections of road in the D.C. region. Southbound lanes were closed overnight Friday, and reopened around 5 a.m. Saturday. Northbound lanes were closed starting Saturday evening, and reopened around 5:30 a.m. Sunday. For the latest traffic and road conditions, visit WTOP’s traffic page. At 8:30 p.m. Friday, repair trucks from Patch Management Inc. rolled through the road. The trucks quickly began working, plugging the holes that have caused speed limits to be reduced. The method the trucks are using to fix potholes is different than what the Park Service has been using, according to Park Service spokesperson Jonathan Shafer. Previously, asphalt was being laid down one shovel at a time. Now, trucks are using an “injection” method that allows them to lay down much more asphalt in a shorter amount of time. The emergency work was first announced earlier this week after members of Maryland congressional delegation met with the Park Service Wednesday. The emergency work comes after discussions between Maryland’s congressional delegation and the park service. The emergency repairs will help improve conditions until a larger repaving project gets underway in April. As part of that project, the parkway will be repaved from Maryland 197 to 198. Over the summers, crews will repave the parkway from Maryland 198 to 175. The second phase also involve repaving access ramps in both work areas. It’s still unclear whether this weekend’s interim repaving will make it safe for a higher speed limit again. “We’re going to work with our traffic safety experts, both in the U.S. Park Police and the Federal Highway Administration and we’ll make a determination about when it’s safe to raise the speed limit again,” Shafer said. Watch what the work crews are doing to repair the potholes.